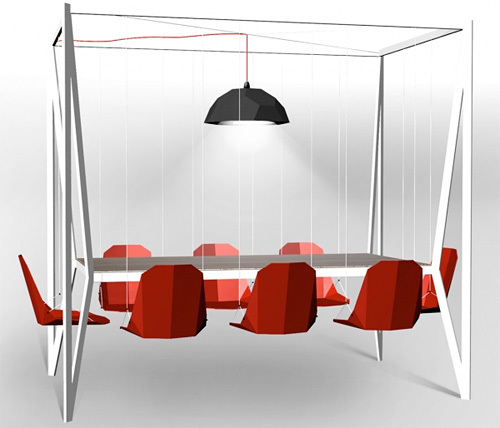 Someone Actually Thought This Swing Table Was A Good Enough Idea To Put Into Production | OhGizmo! The lack of legs under this unique Swing Table is probably the cleverest part of its design since it makes cleaning up the inevitable spills a lot easier. You see the chairs are all suspended by cables from a large frame which also supports the table itself, and are free to swing about while diners enjoy a meal. Now I’m going to go out on a limb here and suggest that the designers have never actually been on a swing before, let alone tried to eat a meal while on one. Of course they’re probably assuming that only mature adults will use the table, but they fail to realize that once you climb on a swing, you won’t stay a mature adult for long. $4,680 (£2,995) available from Duffy London. I can see there they are coming from. Not practical. Maybe fun for board games. A horrific render though.